A hundred and thirty-one years ago, a college in Easton approached a bunch of students in South Bethlehem and challenged their newly-founded “foot-ball” team to a game. Such are the simple origins of the football Rivalry between Lehigh University and Lafayette College. The Rivalry is a big deal in the way that only a game contested one hundred and fifty other times can be. It’s inspired teams quitting in the middle of the game over issues of emotion and fairness. It’s involved postgame brawls, institutional needling, scientific raids of each other’s campuses, pajama marches to serenade Moravian girls, pep rallies filled with smoke, and along the way was an integral part of the formation of the sport of college football, from the days of stocking caps to the days of leather helmets to facemasks to artificial turf. It also inspires fanatical, crazy alumni like me to write books about it. My book, The Rivalry, takes a look at the early days of the Lehigh/Lafayette football rivalry, and how Lafayette College and Lehigh University were founded, how their athletic departments were created, and (of course) how the football Rivalry got to be as emotionally and fiercely contested as it is. It’s available on Amazon and in the Lehigh Bookstore, and it’s great reading for folks who want to know more about Asa Packer, Ario Pardee, the founding of both schools, and the origins of athletics at both schools, as well as the beginnings of the football Rivalry, which were as intense and fiercely fought as any Rivalry game in the modern age. In 1927, the Rivalry was in trouble. The game in question was a 43-0 shellacking by Lafayette, capping off a dismal 1-7-1 season for Lehigh where the Brown and White were outscored 196-31 by their opponents. For Lehigh, losing to Lafayette had become routine. It was their eighth straight loss to their rivals. The Brown and White had last scored a touchdown against Lafayette in 1921. Three entire classes had gone without scoring a touchdown against them, let alone come close to victory. In the span of two years, though, Lehigh would break Lafayette’s spell – first by scoring their first touchdown against the Maroon and White in nearly a decade, and then by beating them in one of the closest games in Rivalry history. The first organized cheering during the Rivalry games appeared to come up organically from Lafayette’s and Lehigh’s students. By the 1890s and the advent of professional coaches, though, faculty and coaches got more involved in cultivating spirit in the teams. Lafayette’s legendary coach Parke H. Davis, contributing to Athletics at Lafayette College, makes no bones about his contributions, making the “creation of an intense football spirit” at Lafayette one of his priorities when he was hired. “Smokers” were athletic pep rallies which took place on the campus to celebrate a wide variety of events, as was the custom on college campuses at the time. During these extravaganzas, the students got souvenir pipes from the smoker as well as complimentary tobacco products. 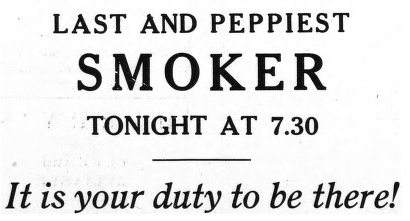 Smokers took colleges by storm in the 1910s, but for Lehigh and Lafayette, the history of these types of meetings goes back further. Going into the 1912 season, the Rivalry was at a point when Lafayette was a dominant force over the Brown and White. In an era where Princeton, Yale, and the Carlisle Indian School all competed for the top, Lafayette was right there alongside the top teams in the nation. And soon, Lehigh would be in the conversation once again as well. In 1911, Lehigh announced their seriousness to vault back into contention by signing four key transfers, including a future Brown and White hall-of-fame quarterback, QB Pat Pazzetti, from Wesleyan. “The Pennsylvania college is pulling strongly for a record-breaking football team this year – hoping to put one on their old rival, Lafayette – and is doing all in its power to get the athletes in the institution,” The Lafayette reported. It was common knowledge in 1893 that Lehigh was a rich institution. 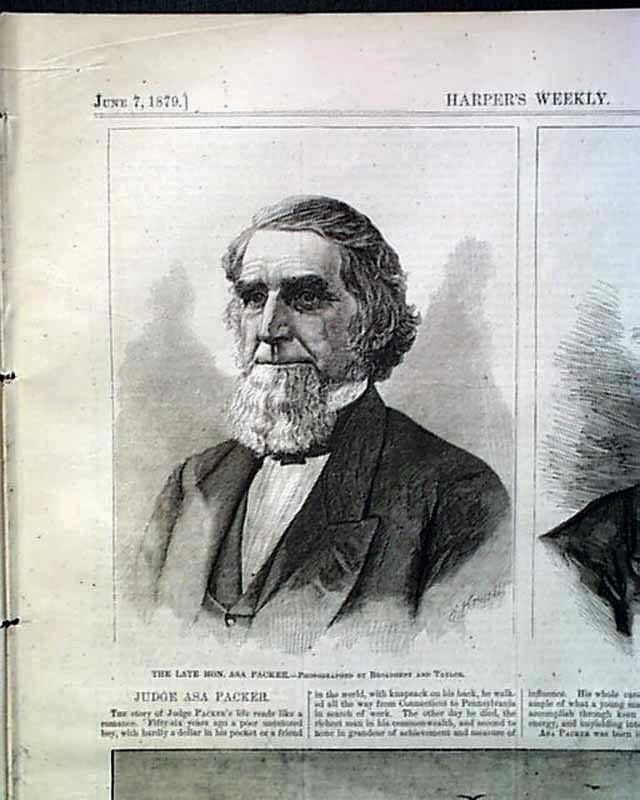 Thanks in no small part to Asa Packer’s bequest to Lehigh of a huge sum of money and stock after his death in 1879, the University was the richest institution of higher learning at that time, surpassing, according to the New York Times, even Harvard and Yale. The vastness of Lehigh’s endowment was actually controversial. For more than a decade Asa’s success in building the railway and navigating the business dealings of the railroad barons kept his family, and Lehigh University, rich, even a decade after his death. But in 1893 that would begin to change. 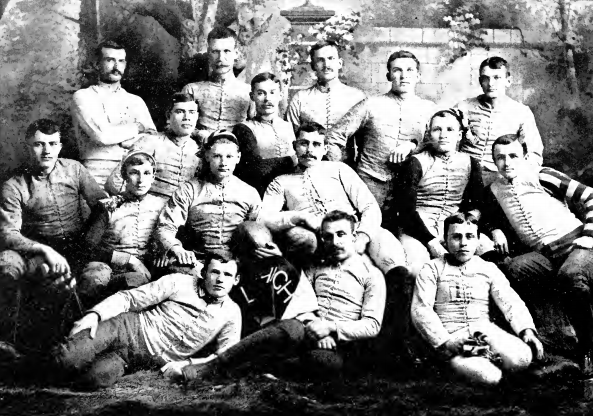 Lafayette dominated the early Rivalry, but in the late 1880s the tides turned dramatically, thanks to a play devised by the founder of Lehigh’s football program. And, perhaps unsurprisingly, the origins of the play have also been disputed with a distinct Lehigh/Lafayette flavor. 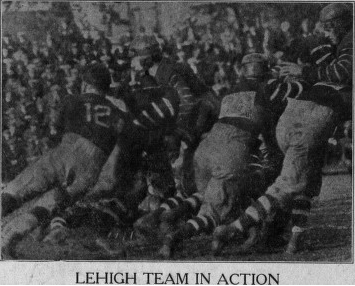 The “V Trick”, or “Lehigh V”, as it’s known in South Bethlehem, was a revolutionary play in college football at the time. It involved, on a kick resulting in a change of possession, to have the eleven men form a “V” with interlocked arms to direct the mass of the entire team against a hapless weak link on the opposition’s line, with the halfback running behind the rush line. This was especially effective after a kick, since the ten men would be able to run forward and get a head of steam going, applying their mass momentum to make larger gains. To some, it was the basis of all the mass momentum plays that followed, such as the infamous “Flying Wedge” implemented by Harvard. Though it would ultimately be banned, plays like the “V Trick” were an important historic milestone in the evolution of college football. And the origins of the play come down to who you believe: Richard Harding Davis, the former Lehigh football player, or Parke H. Davis, the former Princeton and Lafayette football coach. The same year Lehigh and Lafayette started their football Rivalry, the cornerstone for the Statue of Liberty was laid down on Beldoe’s Island on August 5th, 1884. In attendance at that event was the president at that time, Republican Chester A. Arthur, and Democrat Grover Cleveland, who would win the presidential election later in the year. In 1884, Mark Twain lived in a house just outside Hartford, Connecticut, a Victorian Gothic mansion where he and his family settled after he had penned The Innocents Abroad. That year, in the upstairs billiards room, he wrote Huckleberry Finn. 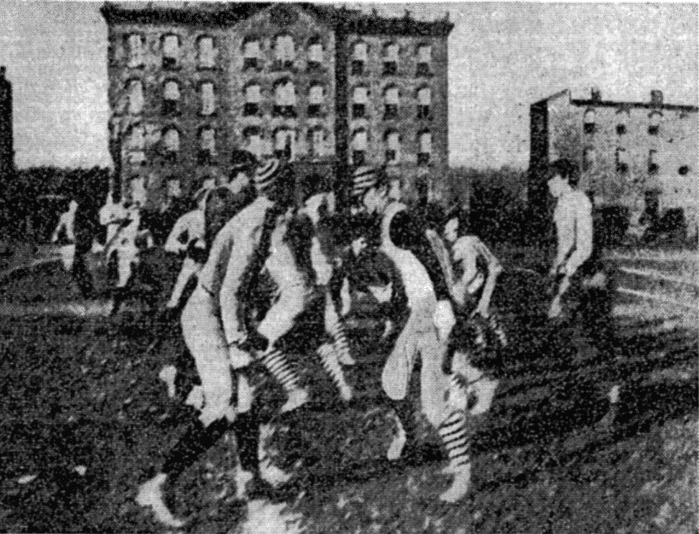 It also would be year of the first-ever meetings between Lehigh and Lafayette on the gridiron, only a couple of years after the early collegiate athletic powers of Harvard, Yale, Princeton, and others had established standardized rules for “rugby football”, as it was still called at the time. 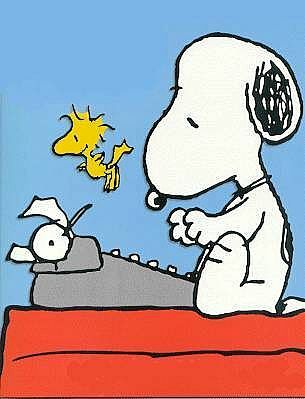 Now I know, dear Reader, you’re not sitting there on your smartphone or computer waiting with baited breath as to why – dear God, why – have I not been cranking out blog postings on a regular basis over the last month. Over the last few years I have been working on a book. And the story of that book continues below the flip.